Credito is a decentralized credit intelligence network providing credit scores, transaction scores and lending marketplace powered by Ethereum blockchain, Smart Contracts and IPFS, bringing enhanced transparency and reliability. Credito is building a Credit Intelligence Network for the credit industry to prevent Credit Risk by identifying fraudulent transactions as they happen, allowing the industry to take well informed decisions. While the growth projections for p2p lending are promising, one of the major challenges is providing a system to reduce fraudulent and high risk activities, as they result in loss of investor confidence and trust. As a solution to the above problems, we have created the Credito Network, or simply Credito. A decentralized network based on Ethereum blockchain coupled with smart contracts and Interplanetary File System (IPFS5) providing Credit Intelligence and Decentralized Lending Marketplace. What is the need of decentralized and transparent Credit Intelligence platform ? Despite the efforts made by banks, card issuers, and merchants, credit card fraud continues to grow faster than credit card spending. Data breaches have resulted in more card details being compromised, and the growth in online shopping has led to more opportunities for ecommerce fraud. According to a 2016 report by Nilson1 , losses from credit card fraud amounted to $21.8 billion in 2015 that’s an increase of 162% from the 2010 figure which was $8 billion. The losses for 2016 are already estimated at over $24 billion, and these losses are expected to reach $31 billion by 2020. On the other hand, peer to peer (p2p) platforms are among the fastest growing segment in the financial services space. The market for alternate finance gained popularity in recent years. A finding by Transparency Market Research suggests that “the opportunity in the global peer-to-peer market will be worth $898 billion by the year 2024, from $26 billion in 2015. The market is anticipated to rise at a CAGR of 48% between 2016 and 2024. Credito encourages the expanding and proficient operation of the credit industry by permitting both fiat and digital resource loan specialists to broaden credit to people and establishments with underdeveloped or a juvenile credit framework. The ecosystem provides solutions to enable any verified lender to safely and securely issue credit to the verified borrower. Decentralization is not only the foundation of the tamperproof properties of blockchains, but the basis of their permissionless nature. 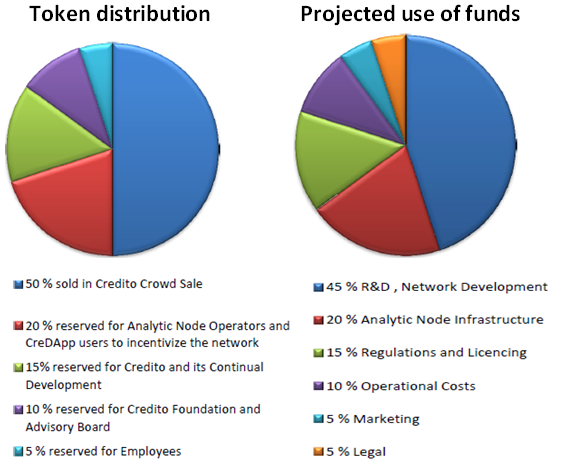 By continuing to build decentralized systems, we aim to further enable permissionless development within Credito. We believe that decentralization is a crucial component for a globally thriving ecosystem with long-term sustainability. Modularity for simple and flexible system design. We appreciate the philosophy of building small tools which do one thing well. Simple components can be easily reasoned about and thus securely combined into larger systems. We believe that modularity not only enables upgradable systems, but facilitates decentralization. Secure, transparent and extensible systems. Credito is built for the community. We value the community and will engage continually with data scientists, domain experts, academics, and security experts for peer review. We encourage testing, audits, and formal proofs of security, all with the aim of creating a platform whose robustness and security can support future innovations.